I'm quite sure I'm uncertain. Miss you Greenpa. Hope all is well with you and the beautiful girl. I miss you guys, too. I've been struggling with a bad dose of "writer's block" for some time now; not the blog so much, but some professional writing I've promised to do and need to do. I've been trying to break that block, so all my available writing energy has been going there. To no real avail. Many reasons. And it's not as easy to just whip off a blog post here as it used to be. The world has become even more uncertain. I could fill up the blog with lists of our woes, easily enough. But; really- I figure you guys have woes enough of your own, yes? My Theory Of The Popularity Of Soap Opera is not so much the commonly cited "misery loves company", but that the great majority of folks can watch a soap and sigh in relief "at least my life isn't as screwed up as they are!" I could probably provide that sort of entertainment. But it's kind of cheap relief. I would like to be able to offer something more substantive. And right now, between tornadoes, earthquakes, nuclear meltdowns, hurricanes, political chaos... etc.... it just gets hard to find, sometimes. It's all pretty depressing, in fact. And neither you, nor I , need more depressing. At my time of life, I've been through multiple episodes of depressing circumstances. When you find yourself becoming petrified by it all, one of the tools that can help pull your socks up is to remember - actively - there is good, and beautiful, stuff in the world, all the time. Then you make yourself notice it. That's the thing- when the burdens get really heavy, and the blows from the careless universe pile up- we stop seeing the good bits. They're there, though. And in exactly that frame of mind, I looked up and out my window. And this is what was right, immediately in front of me. Burning-bright in a spot of August sunlight, surrounded by the shadowed forest. 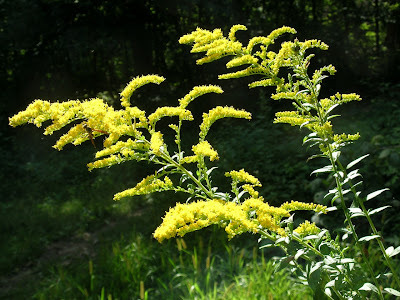 It's just two sprays of goldenrod, lost in the woods. I have fields full of the stuff. So much that I forget to look at it. But I looked at this. And remembered. There is beauty to be seen. Pleasure to be taken, just for the look. If the "click for bigger" feature is working, you will find a wasp in the upper left corner; collecting nectar I'm pretty sure. Good to see one out doing simple work. Of course the irony of having this natural gold, mine for the visual collection, occurred to me; with so much intense, fierce, fussing about the metallic kind now going on. It's there. Free. Easy. Eternal. If you can remember: look for it. I felt better, after noticing. And - two days later - it's still with me. Hang in there, folks. We're all in this together.